So, to start let’s cover the fourth category: Configure the Fabric. I’m not a SAN/storage expert, nor do I have the sufficient hardware in my lab to walk through each of the pieces of storage configuration. So, here are some useful links on the topic. Networking fabric in VMM is one of the hardest (for me) things to wrap my head around, maybe because I have limited networking expertise. 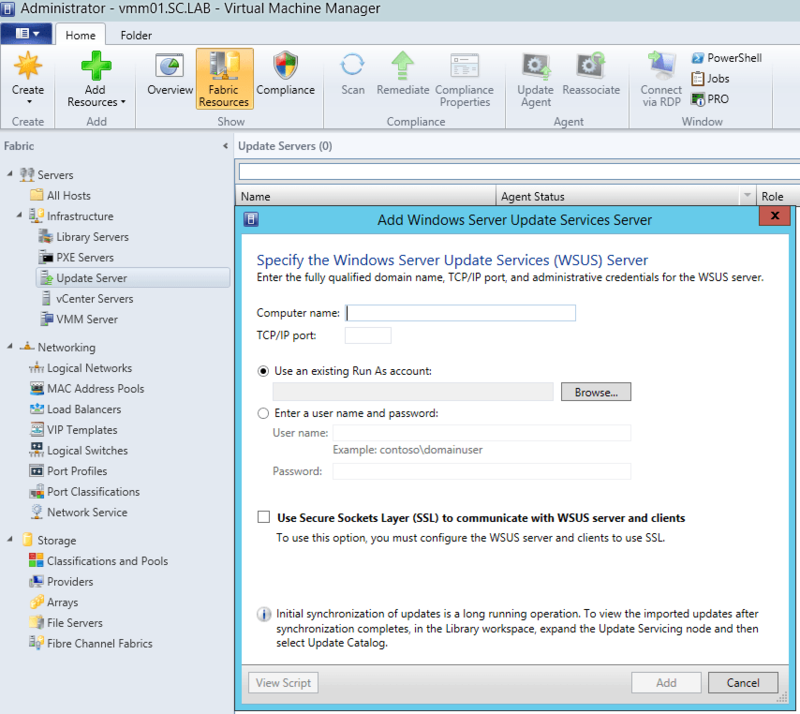 Adding a WSUS server in VMM is easy. What is a little more challenging is using SCCM and VMM together, leveraging the same WSUS server! Here’s a link that provides additional information. The VMM library server is the share/storage for all items like templates, VHDs, etc. It is straight forward to setup, but there are a few other things to know about (i.e. High Availability, etc.). Using WDS with VMM is not difficult, especially if you already have experience/exposure to SCCM. Things you should keep in mind though, include PXE firewall ports, DHCP IP Helpers, and BMCs (especially for bare-metal). There is a lot of information out there on Clouds, since this is the whole premise of “private” and “public” cloud technology. Well, that’s it for this section. Next we will review the items covered in the next Skills Measured – Part 5: Configure System Center Integration.